The aim of this study was to evaluate the relation between aortic artery distensibility, expressed by pulse pressure (PP) and autonomic nervous system function expressed by heart rate variability (HRV), among elders. During 2009, 469 individuals (50 % males, mean age 75 ± 6 years old), permanent inhabitants of Ikaria Island, were enrolled. Among several sociodemographic, bioclinical, lifestyle, and dietary characteristics, and biochemical parameters related to cardiovascular risk, a digital, standard, 12-lead electrocardiogram (ECG) and 5-min ECG monitoring were recorded. Smart ECG measurement and interpretation programs were used for the automated measurement and interpretation of ECG intervals. Autonomic nervous system tone was estimated with the HRV—standard deviation of normal to normal intervals (SDNN)—in surface ECG. Pulse pressure was calculated as the difference between systolic and diastolic blood pressures. Pulse pressure showed a positive association with age, systolic blood pressure levels, and presence of diabetes mellitus (all P < 0.001) and an inverse correlation with logSDNN. Multiadjusted logistic regression analysis revealed that 10-unit increase in SDNN values decreases by 26 % the likelihood of having PP above 70 mmHg; when the analysis was stratified according to hypertension status, the relationship remained significant only among non-hypertensive individuals. 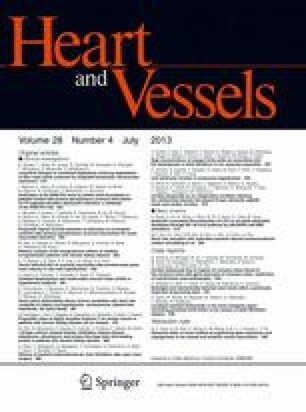 These data support the hypothesis that cardiac sympathovagal disturbance correlates with impaired elasticity properties of aorta, indicating parallel impairment in cardiac autonomic modulation and mechanical vessel wall properties in elderly non-hypertensive individuals. We are particularly grateful to the men and women from the island of Ikaria, who participated in and collaborated on this survey. We would like to especially thank Konstantinos Chronakis for his technical support. We also wish to express our gratitude to the following: Mr Karoutsos (Mayor of Raches), Mr Stamoulos (Mayor of Evdilos), Mr Teskos (Mayor of St Kyrikos), Dr K. Katte, Dr B. Mylonakis, Mrs S. Spanou (Health Center of Eudilos), Dr S. Mamatas, Mr Skaros (General Hospital of St. Kyrikos), and the following field investigators: I. Andreou, D. Aragiannis, E. Christoforatou, K. Dimitriadis, N. Galiatsatos, E. Giakoumi, E. Gialafos, M. Kambaxis, P. Kourkouti, S. Kyvelou, G. Lazaros, D. Maragiannis, A. Margazas, G. Marinos, A. Patialiakas, S. Plytaria, E. Poulidakis, B. Psaroudaki, D. Roussos, G. Siasos, M. Striggou, C. Sykaras, G. Triantafyllou, G. Tsitsinakis, A. Valatsou, D. Vasiliou, G. Vogiatzi, S. Vogiatzoglou, M. Xynogala, M. Zaromytidou, C. Zisimos, V. Zoulia.